Nuclear reactor powered electrical generating plants are being considered to help the U.S. reduce its dependence of foreign oil. They use nuclear reactions to boil water to steam. The steam turns turbines to generate electricity just like in conventional power plants. Nuclear reactors must be located in seismically stable areas with the lowest chance or probability of having an earthquake. They should be located near population centers that would need the electricity produced. Based on your examination of the accompanying map which locality would be the best for building a nuclear power plant, if safety is our main priority? No plant is actually under consideration, but what locality would be best. Reno, because it has the highest population. Carson City because it is the capital. Yerington because it is furthest away from Reno which has a high population. Geologists and Earth Scientists did not originally accept Alfred Wegner's ideas about Continental Drift for which of the following reasons. Wegner worked mostly in the southern hemisphere. Most Europeans were not familiar with the geology of South America, Africa and Antarctica. Wegner was an outsider, he was an explorer and meteorologist (studied weather) not a geologist. Wegner's idea had a major weakness, Wegner could not explain how the continents could move through the solid sea floor. All points are true and may have caused experts of the day to reject Wegners great new idea. Which of the following diagrams corresponds to a mid-ocean ridge? No, absolutely positively this one. The existence of fossils related to dinosaurs in Antarctica is considered to be evidence that? Ancient reptiles, were heavily insulated with fat and lived on the ice sheets. Antarctica was once nearer the ancient equator, and the earth's climate was warmer. Fossils are just rock and don't give us any information about the ancient environment. Seafloor lavas have built-in magnetic “clocks” that reveal their age. When seafloor lava solidifies at the seafloor, its magnetic crystals are quenched in alignment with Earth’s magnetic field, and the rocks’ magnetic “polarity” is preserved. But Earth’s magnetic field has reversed many times over the planet’s history—with the magnetic north sometimes facing south, or vice versa, as it is today. New seafloor is created at mid-ocean ridges (with the prevailing magnetic signature) and spreads out in both directions, creating a symmetrical “zebra-stripe” pattern of alternating rocks with either “reversed” or “normal” polarity. Why does the earth's oceanic crust have magnetic stripes? Magnetic minerals in the lava preserve the earth's magnetic field when they cool. 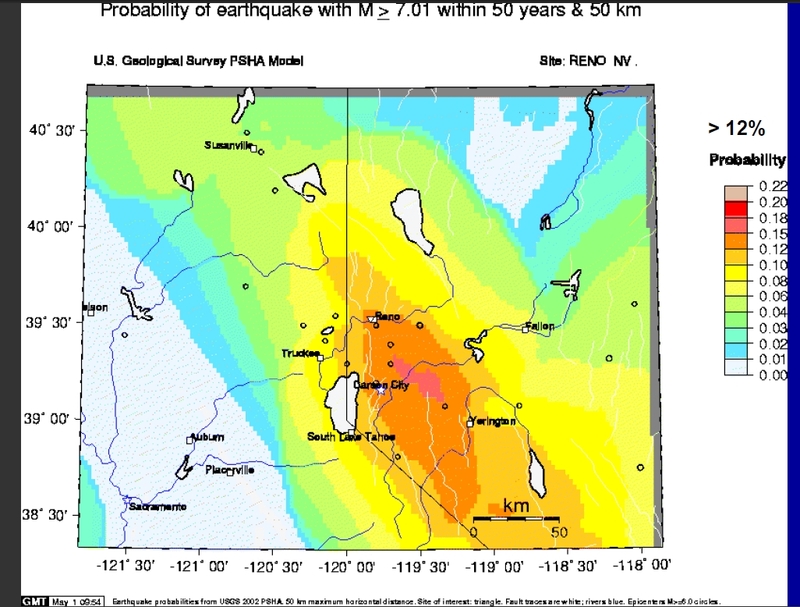 There was an unusual swarm of earthquakes that lasted months. Nothing. Reno is a boring town. What happened in the Reno suburb of Mogul in 2008? Which of the following is the best explanation for why the oldest rocks known on the sea flooor are 160 million years old, but the oldest rocks on the continent are over 3.9 billion years. The continents are above ground, so the geologists can find the oldest rocks. Oceanic sea floor is constantly being recycled by the earth. It is formed at spreading centers and consumed at subduction zones. Oceanic sea floor constantly reacts with 100% organic kelp and sea salt so it appears much younger than it really is. The San Andreas fault is which type of plate boundary? Divergent; with San Francisco and L. A. on the west side of the spreading center ready to fall into the ocean. Transform; with San Francisco on the Pacific Plate and Oakland on the North American Plate. Primary waves are the fastest seismic waves. They always arrive at seismometers first. Secondary waves are always slower they arrive at seismic stations second. The further a P-wave is ahead of an S-wave, the further the station is from the earthquakes epicenter. After examining the following diagram of sample seismograms, which station is furthest from the earthquakes epicenter. 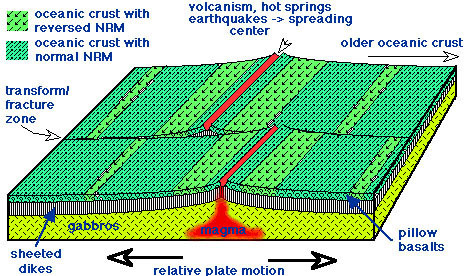 There are three types of convergent plate boundaries. Continent-continent collision. Ocean-Continent convergence. Oceanic-Oceanic convergence. 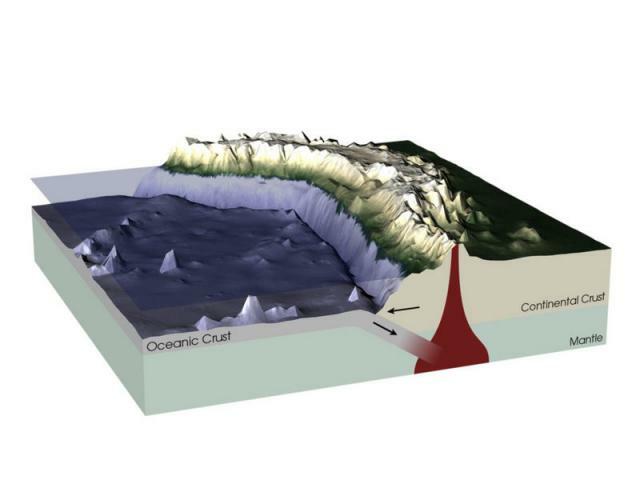 Oceanic crust-Oceanic crust convergence can lead to formation of oceanic volcanic islands. Oceanic-Continent convergence usually leads to the subduction of the oceanic crust. As it descends into the mantle it melts and produces long chains of volcanic peaks such as the Andes, or Cascades. When two continents collide, neither will be recycled into the mantle. Some of the earth highest mountain ranges are formed this way. The mountains may contain ancient sea floor, metamorphic rocks, or sedimentary rocks, but no igneous rocks, as no magma is produced. The exact behavior depends on the mechanical strength an relative density of the plates involved. Ocean crust is thinner and denser than continental crust. 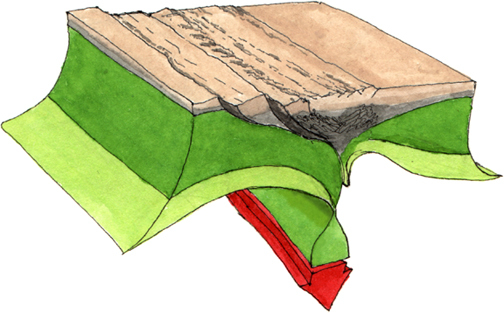 What type of plate margin is shown on the following diagram? 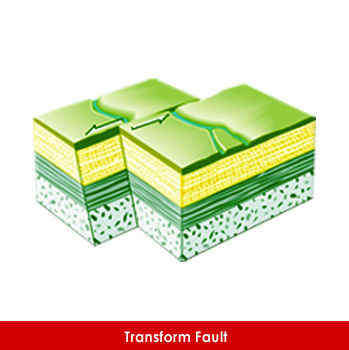 Transform like in the San Andreas fault.